Where “Ogi Jun” was this focused procedural uncovering the convoluted comic-book story of the boy with the manga tattoo, lying in wait for years to exact revenge on the man who killed his father, “Ghosts Of The Past” is dressed as a horror film without any animating purpose. What’s scary about the story of Alexi acting like he has crucial information and subsequently spilling the half-bean he may or may not remember? Nothing, really, but nightmarish sequences sure help pass the time. No, “Ghosts Of The Past” is pure soap opera. 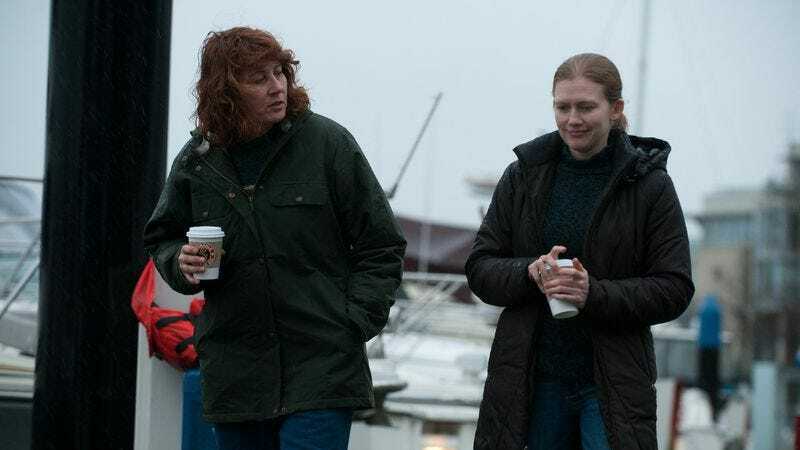 Stan and Terry finally kiss, Jamie goads Richmond into staying in the race, and the latest dun-dun-dun reveals that Rosie wasn’t Stan’s biological daughter and she knew it. It’s a filler episode, and worse, like its little red herring Alexi, it pretends to have something to say. Points for style, but it has almost no connection to substance. The episode begins with a Halloween II-style nightmare of a hooded figure stalking through the hospital to find Richmond. It’s Belko, of course, smiling as he paralyzes the councilman. Then Richmond wakes up. Later, Linden walks into her apartment to find someone already there. It’s her ex-husband, call-sign Helo. Just before he leaves, he says, “You care more about that dead girl than you do about your own son.” See? This isn’t horror. It’s Lifetime, the shallowest psychologies erupting in the most obvious clichés. “Ghosts Of The Past” does a fine job showing that Linden’s getting obsessive to the point of ignoring her sick child and worrying even Holder without putting it in so many words. A little later Linden hears a noise outside and finds a burned-out light bulb. As she recovers from fear, all the other lights go out. She slams the door shut and locks it, and suddenly someone knocks. It’s Holder, who for some reason decided not to call before showing up at his partner’s house in the middle of the night to investigate what looks like a major break in the case. It’s not a major break, though. The episode is marked by these slow, windy pushes in on a scene, as in an early sequence where Linden, Holder, and their phone-tapping guy are standing around a table listening to the message Rosie left on Alexi’s phone. It starts wide and gradually closes in on a circuitous path investigating each character in the shot. But this episode doesn’t slowly close in on anything. The voice-mail reveals that Rosie was scared when she called Alexi from the casino. “I saw him again,” she cries without even the slightest clarification. “God, please, Lex, help me.” Linden and Holder press him on the call, but right when Alexi’s about to reveal who Rosie was scared of, Alexi’s lawyer walks in with Lieutenant Carlson and out with his client. Linden and Holder tail him to Babka’s, but eventually Alexi comes forward on his own. After Linden goes home to check on Jack and Holder gets back in his car, Alexi’s there in the backseat: “Don’t turn around. Just drive.” Again, it’s a fake-out. Alexi’s there to continue their interrogation. All the horror is psychological; the physical world offers only allies and support. Unfortunately, Alexi doesn’t know much. What he does know is that one night when he was with Rosie at the ferry to the casino, she got spooked by a black luxury towncar in the dropoff lane. The windows were tinted, which makes real-world sense but still says a lot about the arbitrary information blockages on The Killing. Rosie wouldn’t tell Alexi why she spent those nights at the casino. He didn’t even know how she found out about Stan. But she did find out that Stan was not her biological father, and that’s what spurred her to act out so much in the months before her murder. So that’s one mystery solved. Stan calls Mitch in one of those windy pushes that closes in on his enormous, immovable back, one lamp lit, his voice doing all the work of the scene, trying to make sure she knows she has space and that he and the kids are doing okay. He’s opening up and all we can see is the back of his head. It’s Mitch who’s the unknowable figure right now, not Stan. Next he goes to Terry’s room, stands outside, and walks away. Lucky for everyone, Terry’s parents show up to ask the annoying questions, like why Mitch left and what happened to that nice married fellow Terry was seeing. For some reason, Stan meets with his lawyer late at night. “I think you’re looking at three to five years,” he says. This time, he doesn’t stop at Terry’s door. They kiss, her phone rings, and the moment is gone. They embrace, but he leaves so she can cry in bed. Mitch is too busy to answer her phone because she’s making friends with the Rosie phantom from “Numb.” She doesn’t have a name, because this is all very literary-fiction. She’s a runaway who bonds with Mitch over Laura Branigan’s “Gloria,” but then they remember what show they’re on and return to their Scandinavian theater. Mitch asks why she ran away from home, the better to understand Rosie, but they are interrupted, and the runaway runs away. There is no answer to Mitch’s question. At the end Mitch sits alone in their booth waiting for the girl to come, but she sees her get into a car and leave instead. “Ghosts Of The Past” is written by Wendy Riss and directed by Ed Bianchi as an episode of windows and reflections, but it doesn’t have much insight or reflection. When Alexi’s lawyer rescues him from the interrogation room, the scene closes with the camera swinging from where it was in the room to Linden and Holder looking in through grated windows. That’s more like it. “Ghosts Of The Past” isn’t about seeing clearly. It’s about obfuscation. That’s what all that horror is about, playing tricks on the mind so it can’t think straight. Like the lens flares that surround Alexi in the back of Holder’s car, it’s a sparkly distraction. It’s Day 18 of the Rosie Larsen case. Do you know where your kids are? 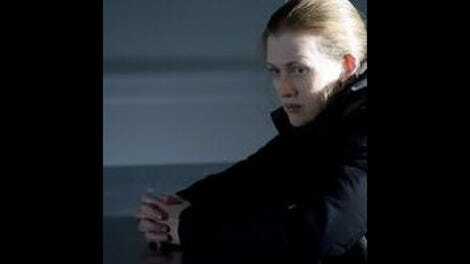 Mireille Enos grows more commanding as Sarah Linden grows more interesting (read: flawed). There’s a terrific moment when Carlson walks in on her outside the interrogation room. She looks to see who it is, returns her gaze to the viewing window, closes her eyes, and prepares to deal with him. It’s also worth mentioning that she calls the cops on Helo when he doesn’t immediately leave. That’s a protagonist I can get behind.